At Keller Graduate School of Management, we understand the value of technology in modern business so we put it at the core of what and how we teach. We emphasize experiential learning to empower students through hands-on knowledge, passionate professors, tools and practices to enable innovative, forward thinking that can help make an impact in the workplace. The knowledge and confidence you can gain from Keller's tech-infused degree programs can help you enhance your personal brand and stand out among industry peers. If you’re on the management track, consider an MBA with one of 10 concentrations that match your desired industry. Want to be more prominent in your field? Choose from one of Keller’s 7 master’s degrees or 9 graduate certificate programs to build on and expand the expertise you have already developed. If you’d like more information on our MBA Programs, take the next step by filling out the simple form on this page. For motivated working professionals standing still is not an option. To help you build your management skills, Keller Graduate School of Management offers graduate certificates in a variety of business and professional fields. Earning one is a great resume builder and a smart way to start earning credits that can be applied toward one of our master’s degree programs. If you’d like more information on our Graduate Certificates, take the next step by filling out the simple form on this page. Keller offers a variety of graduate degree program options in which you can earn academic credit for a Master’s degree, while earning the additional hours required to prepare for the CPA Exam. 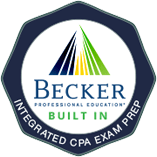 Our graduate offerings present the opportunity to integrate additional CPA Exam Review from Becker Professional Education to aid in your test preparation. It is important to note that most state boards of accountancy require 150 credit hours of post-secondary education in order to sit for the CPA Exam. Students interested in sitting for the CPA Exam should check their state requirements. DeVry is committed to providing the tools, technology and support to help our on-campus and online accounting degree students thrive through graduation and beyond. Program availability varies by location. To learn more, complete the short form on this page.